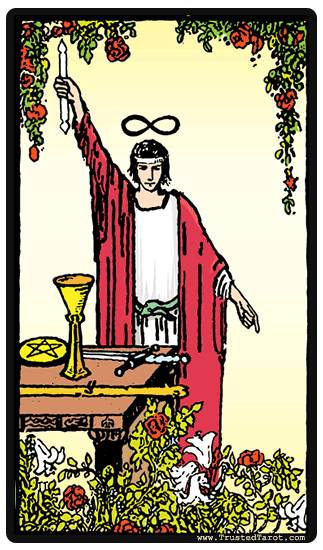 The Magician is one tarot card that is filled with symbolism. The central figure depicts someone with one hand pointed to the sky, while the other hand points to the ground, as if to say "as above, so below". This is a rather complicated phrase, but its summarization is that earth reflects heaven, the outer world reflects within, the microcosm reflects the macrocosm, earth reflects God. It can also be interpreted here that the magician symbolizes the ability to act as a go-between between the world above and the contemporary, human world. On his table, the magician also wields all the suits of the tarot. This symbolizes the four elements being connected by this magician - the four elements being earth, water, air, and fire. The infinity sign on his head indicates the infinite possibilities of creation with the will. The Magician is the representation of pure willpower. With the power of the elements and the suits, he takes the potential innate in the fool and molds it into being with the power of desire. He is the connecting force between heaven and earth, for he understands the meaning behind the words "as above so below" - that mind and world are only reflections of one another. Remember that you are powerful, create your inner world, and the outer will follow. Remember that you are powerful, create your inner world, and the outer will follow. When you get the Magician in your reading, it might mean that it's time to tap into your full potential without hesitation. It might be in your new job, new business venture, a new love or something else. It shows that the time to take action is now and any signs of holding back would mean missing the opportunity of becoming the best version of yourself. Certain choices will have to be made and these can bring great changes to come. Harness some of the Magician's power to make the world that you desire most. When you obtain the Magician reversed, it might mean its time for you to implement some changes. While right side up, the Magician represents true power, the reversed Magician is a master of illusion. The magic that he performs is one of deception and trickery. You may be lured in by the showmanship of his arts, but behind that there may be an intention to manipulate for selfish gain. Getting this card might mean that there is someone who pretends to have your best interests at hand when the opposite is true. Consider whether this reversed the magician is in your circle, or perhaps might also represent your current state of emotions. It may mean you may become obsessed with power and that might lead to wrong, reckless decisions that will lead to your eventual downfall.